A wonderful addition to any diet. Cordoba Wellness Organic Coffees contain unique organic blends that deliver health benefits in every great tasting cup. Years of research resulted in a process of infusing coffee beans with organic botanical extracts to promote wellness within the body. 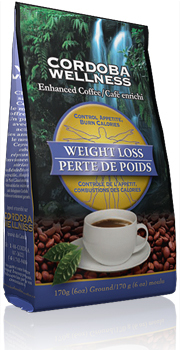 This Fair Trade 100% Arabica product minimizes its effect on the environment by using biodegradable packaging. Your satisfaction is guaranteed. These herbs have been used since ancient times to strengthen the libido in women and men and enhance the sensual experience. Fuel your desire and awake your senses.. Cordoba Wellness Organic Coffees contain unique organic blends that deliver health benefits in every great tasting cup. Years of research resulted in a process of infusing coffee beans with organic botanical extracts to promote wellness within the body. This Fair Trade 100% Arabica product minimizes its effect on the environment by using biodegradable packaging. Your satisfaction is guaranteed. These natural herbs have been known for centuries to reduce stress, relieve muscle tension and improve concentration! Relief of stress and helps you stay focused.. Cordoba Wellness Organic Coffees contain unique organic blends that deliver health benefits in every great tasting cup. Years of research resulted in a process of infusing coffee beans with organic botanical extracts to promote wellness within the body. This Fair Trade 100% Arabica product minimizes its effect on the environment by using biodegradable packaging. Your satisfaction is guaranteed.